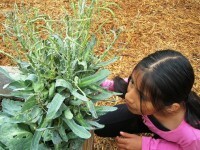 Keep Chatsworth-Murray Beautiful Outdoor Learning Center objectives included increasing the children’s ability to focus, decrease conflicts among children and empower them to make choices of their own. 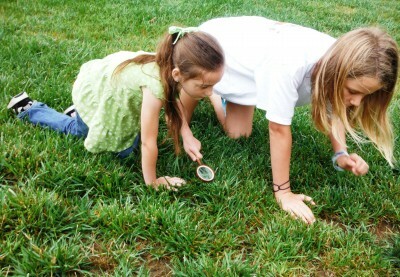 Pathways and plants are used to divide the areas into clearly defined areas. Area names were kept simple and easy for the children to identify. These may eventually change, after more classes use the space, to better reflect the ways the children use and refer to the classroom. A local wood worker made signs with names of each area the names were burned into the wood and then painted so they would endure the weather. The classroom was built on fairly flat, graded terrain. A large pecan tree resides in the middle of the classroom with vegetation kept to low growing varieties so that all areas are visible at all times. There were several large trees that had to be removed prior to construction. 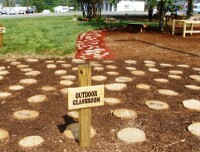 All wood from those trees have been used in the classroom in one way or another. These trees have been used in the Climbing Area, Messy Materials Area, Nature Art Area, and as tree cookies and loose parts. 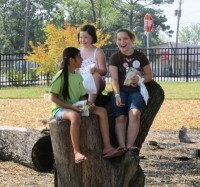 One of the tables in the Nature Art Area is made of a large section of one of the trees taken down before construction and we have stump stools around it for seating. Because the classroom is not located in direct proximity to the KCMB facility, it was crucial that all components and structures in the classroom be made of durable, low maintenance materials. No plastic materials were used in building the space. Even the birdhouses are made of wood. Over 500 native flowers, bulbs, trees and shrubs have been planted since original construction of the classroom. Most of these were donated by local residents and greenhouses. We plant a limited number of annuals twice a year to add color. A pond and fountain in the water area is surrounded by rocks, ferns, lilies, and other plants which are especially pleasing to the eye and senses. 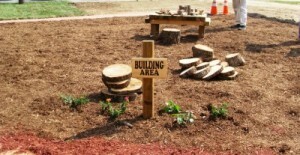 The addition of a butterfly garden in October 2012 has given the classroom a personal touch. With funds received from a United Way Make a Difference Day grant, a patterned walkway was constructed that leads from the main pathway to the garden. Native plants were added, butterfly habitat houses were hung and colorful butterfly decorations were designed out of recycled materials. In addition, because the Garden Area has been designated as one of USDA’s “The People’s Garden”, plots are “adopted” out to the community. To date , two plots have been adopted. One, to a local newspaper and the other to Georgia Power. Pallets from the recycling facility were utilized to construct an herb garden. As more classes are held, more personalization will take place based on feedback from children, parents and guardians, instructors and the community. An Open House will be held in the spring to introduce families and the community to the overall Nature Explore Classroom concept, introduce the Nature Explore Families’ Club, conduct tours of the Learning Center and allow the children to have hands-on experience with all aspects of the classroom. Flyers will be sent home with children and presentations will be made at civic club meetings and schools. There is the potential of reaching over 6,000 children and their families. Keep Chatsworth-Murray Beautiful is very excited about the prospect of conducting monthly workshops for families starting this Spring.